Blueberries and apricots are both in season now and they work well together in desserts. 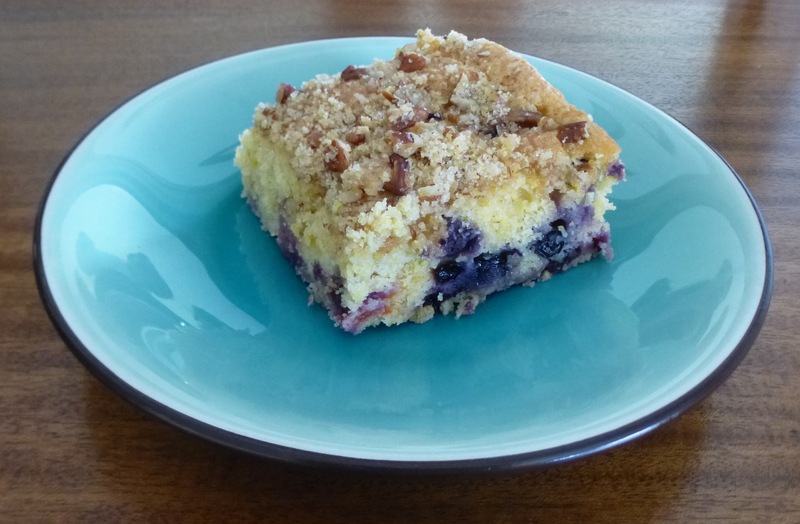 This moist cake has cornmeal in the batter and is studded with fresh blueberries and apricots. I particularly love the crunchy, sugary nut topping. You can change the fruit combination by using apricots with raspberries, cherries, or plums. Blueberries with raspberries or peaches with blackberries would work nicely, too. You can top it with a dollop of whipped cream if desired, but I like it just as is. Preheat oven to 350 degrees. Grease a 9×13 metal baking pan and line with parchment. In a mixing bowl combine flour, cornmeal, sugars, salt, and spices. Mix well. Cut in the butter so the mixture looks like streusel topping. Remove 1/2 cup of the flour and butter mixture for the topping and place it in a small bowl. Add chopped pecans and 1/4 cup coarse raw sugar to the reserved 1/2 cup mixture. Set aside. Add baking powder, baking soda, and orange zest to the original mixing bowl with the flour and butter mixture. Mix well. Beat in eggs, yogurt, and extracts. Mix well until batter is smooth but don’t overbeat it. Gently fold in fruit. Pour batter into prepared pan. Sprinkle the batter with reserved pecan crumb topping. Bake for 35-40 minutes, rotating the pan half way through baking, until an inserted toothpick comes clean. Cool on rack. Serves 12.